Einstein called it spooky action at a distance. It goes against our intuitive conception of the real-world as we experience it. Now it is being studied for a variety of communication and computing applications. Quantum entanglement is a phenomenon when pairs or groups of particles cannot be described independently of the others. The physical properties of the particles are correlated and the correlation persists no matter how far apart the two objects are. One implementation of Quantum Key Distribution (QKD) utilises quantum entanglement to produce a shared secret key which can then be used to encrypt and decrypt messages, ensuring that they can be deciphered only by authorised individuals or entities. The keys are intrinsically random and their security is mathematically provable. Moreover, if we perform a measurement on one of two entangled objects, the entanglement correlation is broken. If this measurement is done by an eavesdropper then the end-users detect no entanglement, and the eavesdropper is revealed. Quantum cryptography was used to protect a Swiss election against hacking or accidental data corruption in 2007. Last year China put the finishing touches on a 2,000-kilometer-long fiber-optic link for QKD, connecting Beijing and Shanghai and also launched the world’s first quantum satellite. Following a presentation at EmTech Asia, OpenGov spoke to Prof. Ling from the Centre for Quantum Technologies and an Assistant Professor, Department of Physics, at the National University of Singapore (NUS) to understand the potential applications of QKD. 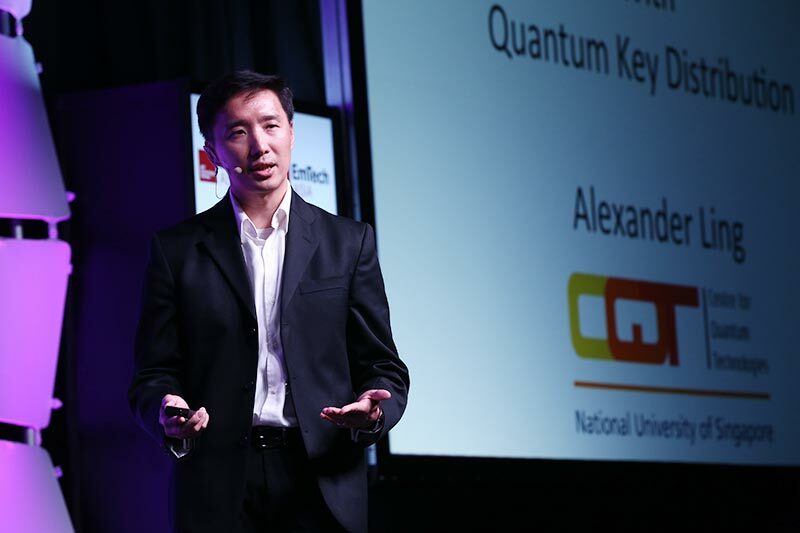 Prof. Ling took part in the first quantum encryption demonstration in Singapore in 2004. One of his latest achievements is the successful operation of a quantum light source on board a satellite in space. Prof. Ling is working on the development of robust quantum systems that can work outside of university labs. He also leads a project in the NUS-Singtel Cyber Security Lab to develop QKD for local fibre networks. The biggest challenge is the robustness of the devices. The light source that generates the photons for quantum entanglement is very sensitive to vibrations and temperature fluctuations. Some of the most immediate applications would be to see whether QKD devices can be integrated into existing telecommunication systems over fiber. This can then be used to secure any points sharing the optical fiber link. Prof. Ling is currently working to overcome the technical challenges faced in building a global quantum encryption network. There are two major directions. One is to develop devices such that the quantum key distribution protocol can work over optical fibres. The second major direction is trying to put those devices into satellites, to expand the range of quantum key distribution. Prof. Ling’s was the first team in the world to operate a quantum light source on a small satellite, launched in Decemebr 2015. These small shoebox-sized satellites are called CubeSats. By using satellites the team hopes to provide global QKD coverage. While optical fibers work over metropolitan distances, the useful range is limited to between 50 and 100 km, unless you invest in expensive research grade components. By using satellites equipped with optical links, the range of QKD can be extended. When asked about the implications of QKD for cybersecurity, Prof. Ling replied that this is the only known instance where a method for distributing encryption keys is very strong on paper, or more precisely, it has “information-theoretic security”. There is a very good mathematical proof that the signals themselves are not hackable by brute force computation. This means that data encrypted with the assistance of QKD will remain private into the future, even when more powerful computers are developed. The challenge lies in moving from paper to implementation. Once the implementation is done, there are often physical side channels that allow attackers to access the system. It would be important to find out the possible physical side channels and close them. “Technology based on the latest insights into quantum systems may first appear in the market in the form of random number generators,” Prof. Ling said. A lot of random number generators on the market are based on mathematical processes, called pseudo random number generators. The string can be predicted once you know your input. But there is a new class of quantum random number generators appearing nowwhich are very fast and completely unpredictable. No matter, how much historical data you record from the device, you will not be able to predict its next output. The cost per bit of entropy is also coming down very quickly. QKD can be also used to synchronise atomic clocks. At the moment, atomic clocks are present in many places such as cellphone towers or data centres. They are synchronised with each other using GPS. If GPS signals were disrupted for some reason, then the atomic clocks will go out of synchronisation. Prof. Ling explained the use of QKD in this context, “These quantum signals we are using for key distribution can also be used for synchronising atomic clocks. This can be a sort of a back-up for time synchronisation. That’s one of the things we are studying in SingaporeAs a bonus, the technology needed to synchronise atomic clocks using a quantum signal is much simpler that needed for quantum key distribution. Prof. Ling expects good prospects for fibre-based QKD. However, for satellite-based QKD there are some challenges. One of them is the transmission signal from the satellite to the ground. At the moment it is very lossy. People are studying how to get around the losses.